Well, as talented as she may be with any one of the graphics programs from Adobe, she had a little bit of trouble this morning with something else — a curling iron. The picture above was taken after Michelle returned from the doctor’s office. 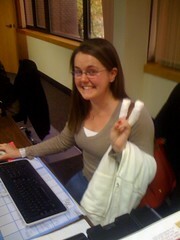 Yes, she tried coming to work today despite the burns on her fingers. I honestly will never forget the sight of her typing with one hand, while the other hand was in a bag of ice. Michelle was burned by the tool. Is she going to throw it away? Is she going to hide the curling iron in her basement? Of course not… I have no doubt that she’ll be rocking the 21 Concord Street office with some curls by the end of the week. When it comes to marketing our product or services, we may occasionally get burned. Perhaps it’s a new marketing channel that we try out for the first time… or a new software application… or maybe we use a new employee to help us out on a task. Let’s say that our expectations do not get met. How do we react? We must be willing to fight the urge to spite the tool that may have let us down. Rather than quickly ditching it for what’s next (or what worked for us last year), we must be willing to invest time and effort into analyzing why something may have performed lower than our expectations. We must also be willing to put that intelligence to work, and try to make it more successful at another time. Sure, it’s no fun to get burned. We may want to shed a few tears in the kitchen when it happens. That’s okay… But don’t be afraid to try putting a few more curls in your marketing efforts. Most likely, you’ll be styling sooner than later.